Somewhat poignantly, just 2 days after the release of the iPhone 4S, Steve Jobs passed away peacefully last night, surrounded by family. Obama could not have put it better. Social networking sites, particularly Twitter, are experiencing huge volumes of traffic as tributes pour in from around the world. We have lost someone very special indeed. His CV included Chairman and CEO of Apple, CEO of Pixar and Walt Disney Company’s largest individual shareholder and a former member of its Board of Directors. 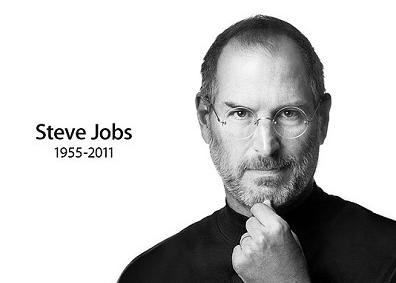 He was considered a leading figure in both the computer and entertainment industries. The phrase “big shoes to fill” must have been overused after the Tuesday night launch of the iPhone 4S. Tim Cook, brilliant as he may be, might never be able to prove himself as worthy a successor. The applause at the beginning of the launch was lukewarm, almost muted. Something was missing. The first Apple launch without Steve, with his iconic black turtle-neck sweater and jeans, coupled with the disappointment at the 4S and not an iPhone 5, would explain the reason that Apple stocks fell by ten dollars on that Tuesday. Steve Jobs is synonymous with intuitive technologies, breaking the barriers of possibility. He made products a lifestyle, he was a marketing genius. Steve was perhaps the only one to prove that nerds can be seriously cool.